Rockman Corner: Capcom Wants To Know: Aero Or Sephira? Capcom Wants To Know: Aero Or Sephira? In Japan, she's known as Aero; for the rest of the world, it's Sephira. Mega Man Legends 3's newest heroine has developed quite a following already, and there's been many opinions about her name. 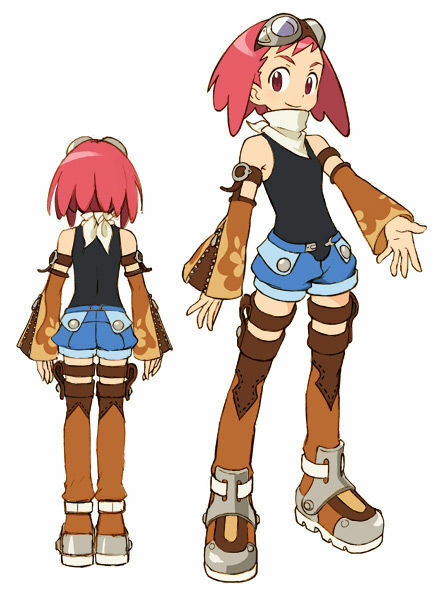 Well aware of the matter, Capcom is officially seeking input: Should this new character be named Aero or Sephira in the US release of Mega Man Legends 3? You can vote on which name you prefer at Capcom Unity. As noted by the US devroom's new liaison, GregaMan, there's no guarantee that they'll change the name, but the results may affect the final decision. As of this writing, Aero leads the poll at 62%, with Sephira at 32%. Cast your vote here! I'd rather know why they changed it in the first place. It's like Capcom US have a quota of name changes to meet, what the hell. Aero, Aero, Aero. It goes perfect with Tron and Roll. Tron, Roll, and Aero. Man, am I glad they are letting us vote on this. Aero, definitely. Sephira never sounded right or looked like it went with the character design to me. - I wonder why is Capcom changing her design like crazy. It's changed once again. She doesn't look like a "Lilly", but she doesn't look like a "Sephira," either. I'll say "Aero." And here I was just getting used to calling her Sephira... Still, this will be cool if they can get her name changed back to Aero. I rather Sephira better than Aero. I voted Sephira. Depends on whether it's "sepheera" or "sephyra". Pretty fond of Aero, but not because it's "more original". Less so, I think. Sounds better though. I personally felt that Sephira was a bit too.... Angel-JRPG-goddess character-like. Something that this girl doesn't seem to look like. So yeah, Aero sounds better. The 3 syllable name doesn't fit with Roll and Tron, therefore, Aero. Two syllables, but still four letters. Sephira actually sounds much nicer. Very befitting of her looks, if I may say. Capcom has the worst localization teams. We don't need stupid name changes! The only case when I get a name change is when the name has been copyrighted. And even then it's irksome. I voted Aero. It's cute, it's short, and besides, Sephira was taken by Christopher Paolini in "Eragon." Besides, I can totally hear MegaMan saying, "Hi, Aero!" It just works.